Fall is a time filled with foliage, football, friends & family, but fall is also when we celebrate our store's anniversary. This year we using our birthday an an opportunity to celebrate you, our incredible customers for the support you've given us over the past 34 years. We're celebrating by rolling out our biggest giveaway yet, and we're calling it THE BIG FALL GIVEAWAY! We know, pretty original. Here's how you enter to win! When you spend $200 or more at Northshore Sea Bright between now and November 25th, you'll get a chance to enter your name into the giveaway. It's simple! Drawings will be made on November 25th, and all prizes must be picked up in-store. Quick note: the Vineyard Vines, Southern Tide, and Johnnie-O gift certificates can only be used at Northshore. To be notified regarding future savings, giveaways, and special events, be sure to enter your best e-mail address at the top of the page. 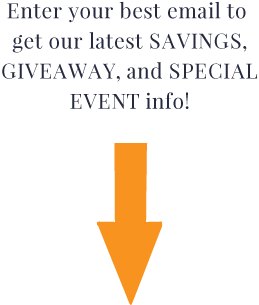 Now you'll never miss out on any our savings, giveaways, and special events! Remember, the only way to enter THE BIG FALL GIVEAWAY is to come in and visit us at the store.